The Talbot County Courthouse is located at 11 North Washington Street, Easton MD 21601; phone: 410-770-8001. Photo: Ratcliffe Manor (Henry Hollyday House; ca. 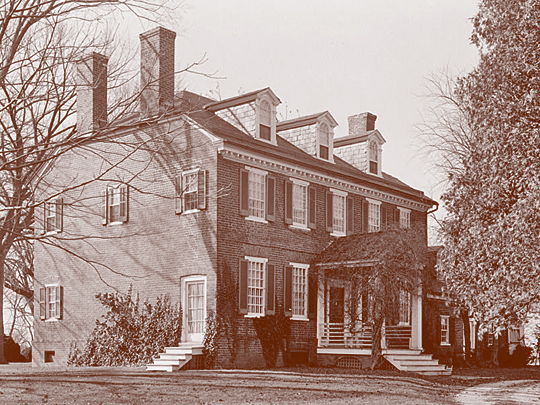 1749), Ratcliff Manor Road, near Easton, Historic American Buildings Survey [HABS MD-89], Thomas T. Waterman, photographer November 1940, memory.loc.gov, accessed July, 2012. Organized in 1861, Talbot County was named for Lady Grace Talbot, the wife of Sir Robert Talbot, by her brother, Caecilius Calvert, the second Lord Baltimore, and the first Proprietary of the Province of Maryland. Originally more than three times its size, it embraced the whole of Queen Anne's and Caroline counties and the southeastern part of Kent County, including all the land between the headwaters of the Choptank and Chester Rivers, extending eastward to the Delaware line. The county was formed on the regular progression of the settlement of the State in 1660. In 1850 it contained 13,811 inhabitants. In that year there were 793 farms covering 114,109 improved acres and 55,312 acres of unimproved lands. Major crops were grain (wheat, rye, barley, oats, corn, buckwheat), seed (grass, clover, flax), wine, beeswax, and honey.